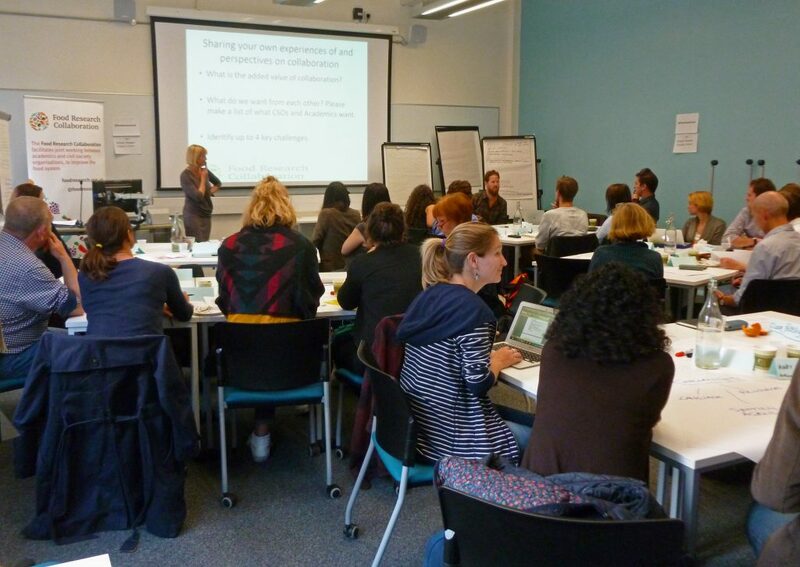 35 delegates from universities and CSOs across England and Wales met in London on Wednesday 5th October to discuss the challenges and opportunities involved in collaborating on joint working initiatives. Participants reported the workshop to be useful with one summing up with, “We are all in it together. Collaboration is key. We need to put our differences behind us and move forward for a better, fairer food system”. The day began with a welcome from Professor Corinna Hawkes (FRC), and short presentations from Victoria Schoen (FRC) on lessons from the literature on the benefits and challenges of collaboration (see presentation), and experiences on the ground from Mark Dooris (University of Central Lancashire) and Mark Fishpool (Middlesborough Environment City). Participants discussed their own experiences of collaboration around the three areas of: added value; what CSOs and academics want from each other in a collaboration; and the challenges they perceive. Collaboration can lead to more applied results as well as reducing competition for scarce funds. working in collaboration can be more complicated than working alone. The FRC have since published a briefing paper “CSO-Academic Collaboration: theory and practice” available here.